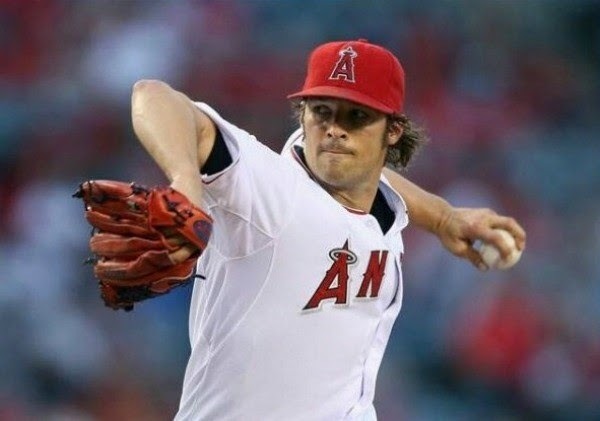 The Makeup Examiner caught up with Los Angeles Angel’s pitcher and Head & Shoulders Mane Man, C.J. Wilson on Aug. 13 in New York City. C.J. is in the city to play against the Yankees and took time out of his busy schedule to discuss his fiancée supermodel Lisalla Montenegro, his philosophy of life, and his secrets for always looking so amazing. Congratulations on your engagement to Lisalla! How did you propose? C.J. : I’d wanted to do something really special. Initially I was going to try Griffith Park and catch Lisalla completely by surprise. Although, I’d commissioned a [engagement] ring and had it since March, the opportunity didn’t present itself until May. And it was actually a really unexpected opportunity. We [Lisa and I] were staying with friends in Houston and I’d carried this ring around with me for months. My friends knew that I had the ring, even their kids knew, which kind of had me a bit worried because I didn’t want the kids to “rat me out”. So one night while we were getting ready for bed, Lisalla was saying ‘I love more’ and I said, ‘No, I love you more and I can prove it’. I went over to my backpack and grabbed the ring, showed it to her and it took Lisalla a few minutes before she realized that I was asking her to marry me. Between baseball and racing, you are an extremely physically active guy, but you always look picture perfect. What’s your secret? Do you follow a specific grooming regimen? Keeping clean. I shower a lot. Because I’m always on the go with baseball, working out, racing (C.J. has his own racing team) … and as a spokesperson for Head & Shoulders I don’t want to look like a dirty mess so I’m pretty mindful of my appearance. I’ve seen a few of the Head & Shoulders “Good Happens” ads. They are hilarious. Did you have fun shooting them and what’s the slogan … something about smelling handsome? You’re out in the sun a lot and, at 32, I imagine that you’ve adopted a skin care regimen. What skin care advice do you have for the guys? First, I don’t drink or smoke. (Readers, this adheres to C.J.’s Straight Edge lifestyle, which both he and Lisalla follow) I would recommend that you adopt a good shaving regimen. I shave at night before bed and do this because if I were to shave, let’s say, before a workout, all that sweat and dirt would just go into my pores. Another tip is that I don’t go to bed with any product in my hair. I wash my hair with Head & Shoulders, which is the official shampoo of Major League Baseball and makes it easy for me to have a great product to use on my hair at the stadium. Lastly, I always use SPF. I’m constantly out in the sun so protecting my skin is must. Your charity, C.J. Wilson's Children's Charities, is gearing up for the 5th Annual Throwing Strikes bowling tournament in September. What is the charity’s mission? Yeah, Throwing Strikes is a lot of fun. It gives me a chance to interact with fans and everyone an opportunity to participate in an activity that sort of levels the playing field. As for the charity, we raise funds, awareness, and encourage youth participation in community service and charitable giving that will directly benefit children and their families affected by chronic, life-threatening illnesses or dealing with social or financial challenges. I also participate in the RBI Program, for which Head & Shoulders graciously supports through their “Season of the Whiff” campaign. What The Makeup Examiner took away from her interview with C.J. Wilson, was an impression of a terrific role model, which can be a rarity in professional sports. C.J is a genuine and intelligent guy who loves life and goes through it making sure to think of others. Note: A very special thanks to C.J. Wilson for taking the time to chat. It was a true pleasure.